Foodzy is a social food game that lets you easily check in your daily food & drinks intake for insight into healthy living. Today the food startup launches a lite version of its mobile apps for iPhone and Android that enables all users to try the service for free or create a new account. Pro users – who pay a small fee of $15 per year – receive an all new and improved personal dashboard in the app’s most recent upgrade. The dashboard shows your daily stats for weight and bits (calories), the amount of fluids you drank today, your favorite food and all time high scores for your weekly calorie & drink intake. Also going live today is Foodzy’s integration with the Withings wifi body scale that automatically records your weight, fat mass and BMI. Users can now connect their Foodzy account to their Withings profile and automatically import their weight stats every day. Next up on Foodzy’s roadmap is integration with other health hardware such as FitBit and Jawbone’s UP, which will enable users to match their daily calorie intake against their daily calorie burn rate. The new improved personal food dashboard and Withings integration makes it even easier track your daily food pattern and weight progress. There’s no more need to update your daily weight manually - the dashboard shows you vital feedback on eating behaviour and fluid intake. Everyone knows you should drink 2 liters of fluid per day, and now Foodzy makes it really easy to track this daily health goal. Since its global launch in July 2011, Foodzy’s database has grown from 50,000 to over 150,000 food products, most of it crowdsourced by users. The service uses localized product databases per country, so users can easily search for the products available in their local supermarket. 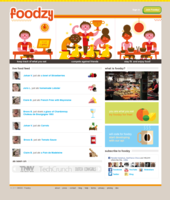 Foodzy is currently available in 120 countries and four languages.